NDAFW events, including National Drugs & Alcohol Chat Day, are great ways to engage students about drugs and drug abuse. If you want to prep students before NDAFW, check out the resources below. Participating in Chat Day? To view the chat live or to participate if your class is registered, computers must have internet access. 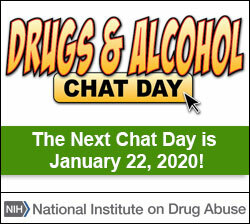 You can also use past Chat Day transcripts as part of a drug facts lesson. Transcripts are typically posted within 2 weeks after the live chat. The following information can help you and your students prepare for NDAFW and National Drugs & Alcohol Chat Day. Every year, three major federally funded surveys measure drug abuse trends among America’s youth. Reviewing recent data may help your students to ask NIDA’s experts informed questions about use and prevalence. See more infographics showing the latest trends in teen drug use. This annual survey studies the extent of drug use among 8th, 10th, and 12th graders. It is released the same year that the data are collected, so findings are current. The Substance Abuse and Mental Health Services Administration's NSDUH reports the prevalence, patterns, and consequences of alcohol, tobacco, and illegal drug use and abuse among the U.S. population, ages 12 and older. Conducted by the Centers for Disease Control and Prevention, the YRBSS monitors six types of health-risk behaviors that contribute to the leading causes of death and disability among youth and adults. Check out our Order Free Materials page for science-based educational publications. NIDA provides Drug Facts pages that are written specifically for teens. Reviewing them will help teens get basic information about drugs of abuse and may help them form more in-depth questions during NDAFW events or Drugs & Alcohol Chat Day. For the complete list, visit NIDA’s Teen Drug Facts page. Created for classroom use year round, these materials will help to engage and inform students as they embark on a journey to get the facts about drugs and drug abuse. Search for free lessons and activities on the science and consequences of drug use. All lessons are based on national science and education standards and were developed by scientists from leading universities and the National Institute on Drug Abuse. Science-based facts and lesson plans include the Drugs + Your Body: It Isn’t Pretty web interactive from Scholastic and NIDA about the effects drugs have on the teen brain and body. From brain scans to virtual reality to celebrities, the NIDA blog for teens covers it all. Check out our Drugs & Health Blog. Are drugs on the street today more dangerous than they were 20 years ago? Why do people use medical marijuana? What happens in the body when a person overdoses? How do I know if a friend is in trouble with drugs? What is drug abuse treatment? Why do celebrities go back to rehab again and again? Does marijuana make people more likely to drop out of school? What drugs cause the most car accidents?